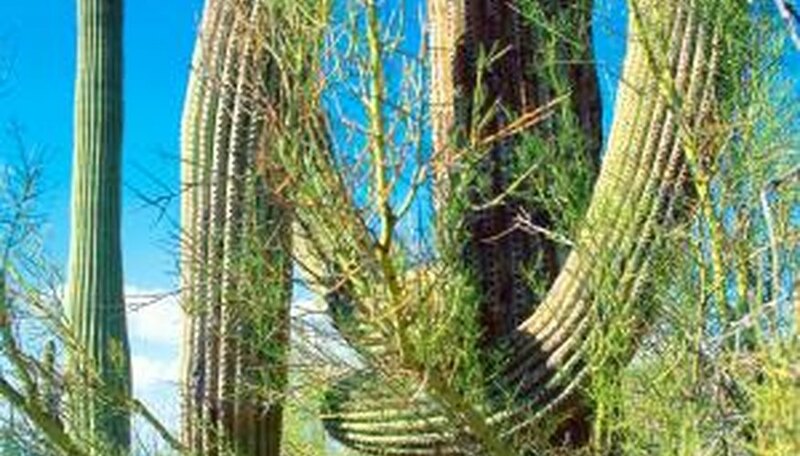 Sonoran Desert plant adaptations aid plants in surviving the desert’s hot environment -- trees with green trunks that carry on photosynthesis in the absence of leaves excel in this Arizona desert. Trees are rare in the harsh desert habitat and those few that have evolved to thrive in summers when temperatures routinely reach 115 degrees Fahrenheit are treasured by most homeowners. It’s hard to not respect a tree that shades the desert floor as well as home landscapes while nursing young cacti. Being concerned about potential health issues of these desert-dwelling plants is not unusual and being anxious when the leaves of the palo verde turn brown is natural. Palo verde trees are opportunistic desert plants that quickly take advantage of scarce rainfall to produce leaves and flowers following seasonal rains. 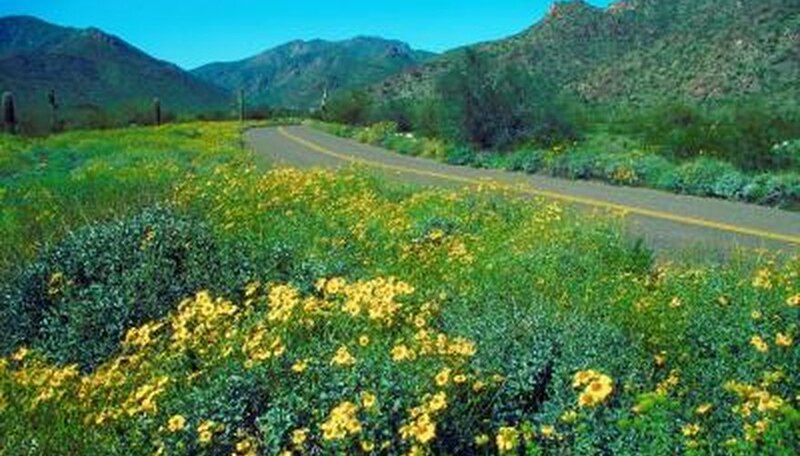 The Sonoran Desert receives two seasons of rain, in the winter from the Pacific Northwest and in the summer from tropical monsoonal flow locally called Chubasco. When these rains arrive the desert blooms. Two commonly planted native trees, blue palo verde (Parkinsonia floridum, formerly Cercidium floridum) and foothill palo verde (Parkinsonia microphylla, formerly Cercidium microphylla) have green trunks and branches that conduct photosynthesis after the leaves drop -- after water from the Chubasco season has disappeared. This leaf drop is a survival adaptation and normal. Both palo verdes are Sonoran Desert indicator plants -- this desert is their home range. They are capable of enduring 115 degrees F and occasional brief snowfalls. They require less than 10 inches of rain per year and thrive in U.S. Department of Agriculture plant hardiness zones 9 through 11. The tree’s deep tap root system makes it possible to locate water when there’s nothing near the soil’s surface. Palo verdes are short trees with maximum heights of about 32 feet; they have small leaves with bright yellow flowers in April followed by seed pods. Their filtered shade protects small cacti and animals and provides food and shelter for many birds, including hummingbirds. A common problem with palo verdes arises from too much water and too much love. When the drought-induced leaf fall occurs naturally, many unfamiliar with the tree overwater, attempting to keep the leave green. Both palo verde types are susceptible to deep planting, excess irrigation, and mulching -- these practices lead to rot and leaves will turn brown with the tree eventually toppling over. This delicate-looking tree doesn’t appreciate that much attention or water. Save water and money by cutting back on the watering and the leaves will probably bounce back. Hardy palo verdes aren’t vulnerable to many pests. The palo verde root borer (Derobrachus geminatus) is the larval stage of the large (3- to 5-inch) palo verde beetle. The 5-inch grub attacks the roots of the tree, gradually killing it over seven to 10 years. The grub is rarely seen above ground. The best protection for your tree is to keep it healthy. Root binding in fast-growing palo verdes frequently happens to nursery-grown trees. Their roots grow deep and fast to locate water. The roots will wrap in tight balls when restricted by containers, occasionally strangling the trunk, leading to the tree’s failure and naturally to leaf-browning and leaf-fall. Examine the root ball before buying container-planted, nursery-grown trees. The problem can be corrected by pruning the circling roots; failure to do so can lead to problems later on, advises the University of Arizona.